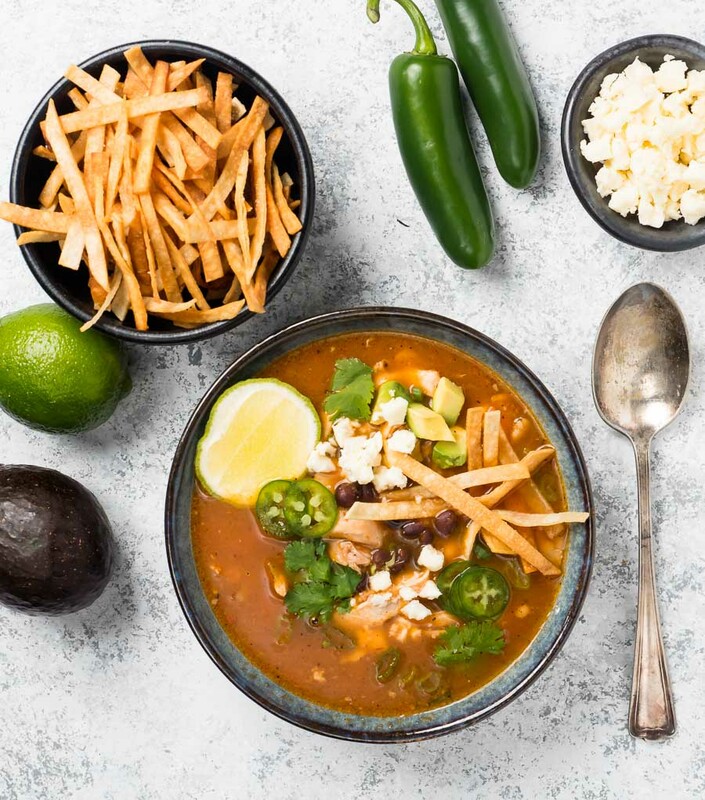 This is pretty authentic chicken tortilla soup. There are a couple of tweaks that might get me in trouble with purists. 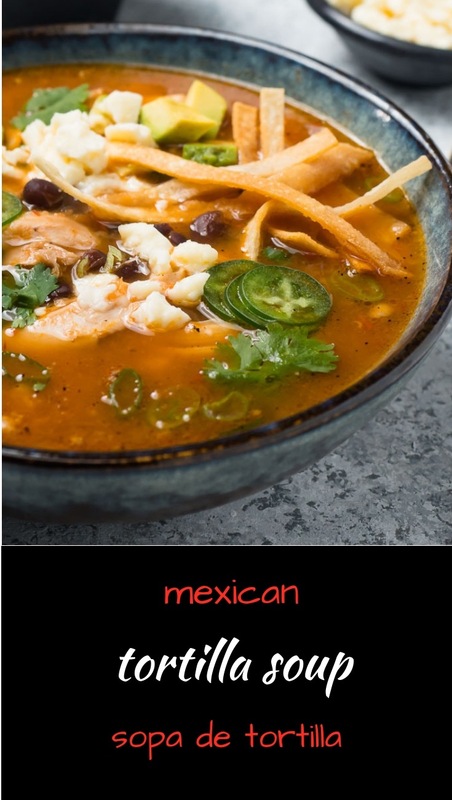 But if you want a satisfying bowl that’s better than your local Mexican joint read on. This is soup. And the backbone of soup is stock. So it makes sense to try to get every bit of chicken flavour into your soup. At least it makes sense to me. That starts with gently cooking the chicken in the stock. That’s a trick you should always use. Gently poach your chicken in stock. Gently is the operative word here. You want to take your time. Bring the chicken up to an internal temperature of 175F. If you have time then put the chicken bones back into the stock after you remove the chicken. Cook it some more. There’s flavour in those bones. Dry roasting vegetables is a pretty common technique in Mexican cooking. It’s easy. Just heat up a comal or a cast iron frying pan. Slice your onion into 1 inch slices. Toss them on the hot comal. Nestle the garlic in where you can. And dry roast. The garlic is done when it gets little black spots. The onion is done when it’s soft. You can do jalapenos like this too. Tomatoes are tougher. You need to broil them. That’s why I use canned fire roasted tomatoes. Easy. No mess. Maybe not quite as good but close enough. 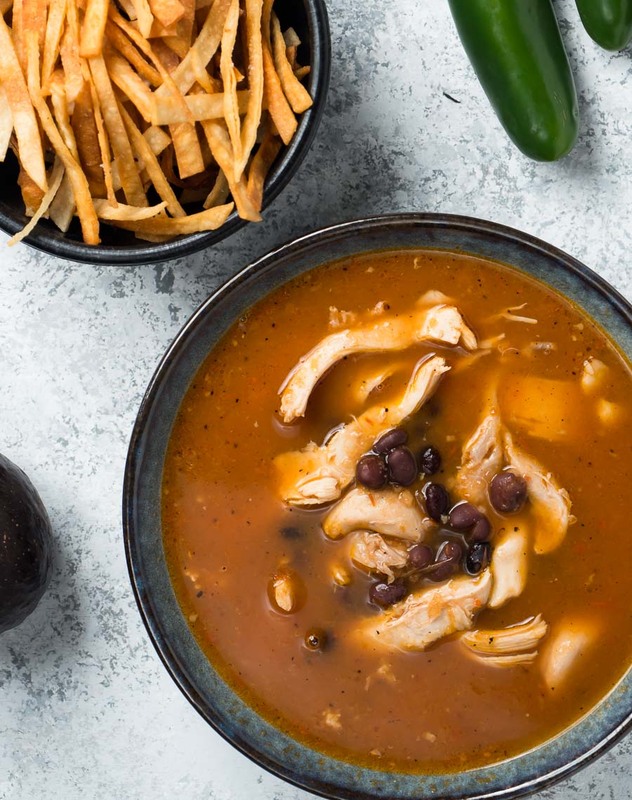 I like black beans in my chicken tortilla soup. They add a little extra. A different flavour. A different texture. I just like black beans. They are optional so if you don’t just leave them out. 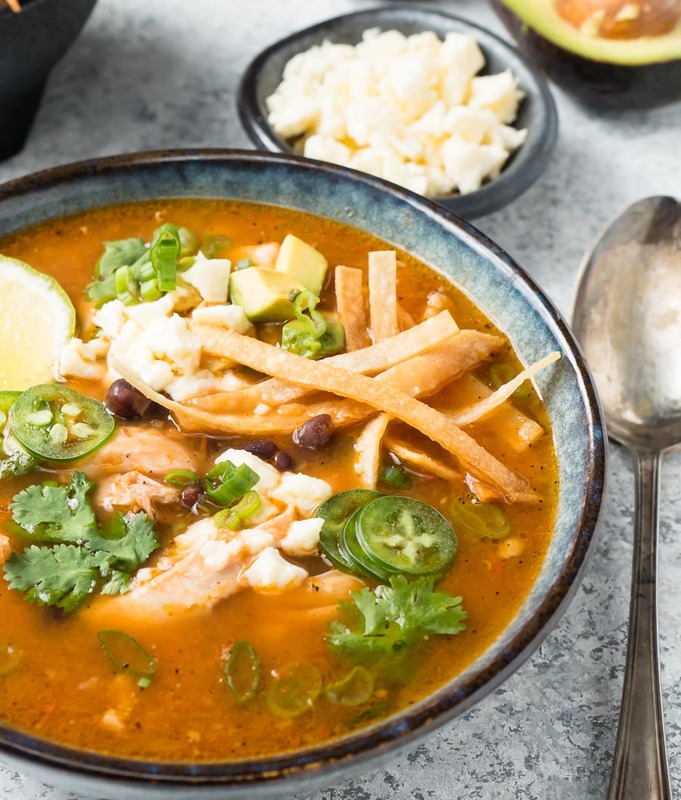 Technically if you add black beans you can’t call it sopa de tortilla anymore. It becomes tarasca. I don’t know why. It just is. Don’t lose too much sleep over it. I don’t. Technically it’s only one different ingredient. 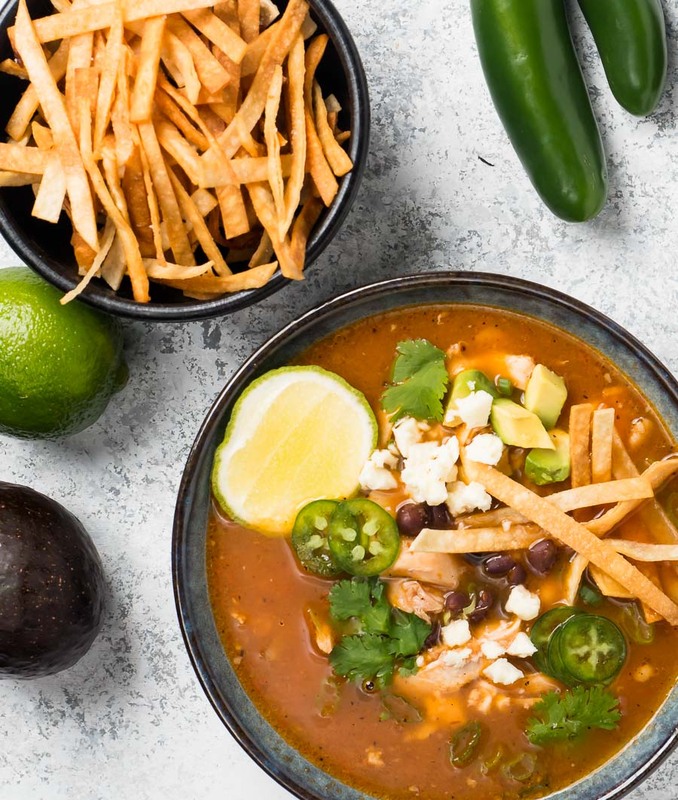 Tortillas are part of tortilla soup. What’s different is I like to puree a couple tortillas right into the broth. It gives the soup a little more body. You don’t have to. If you want more traditional layer fried tortillas in the bottom of your bowls. I do that too. Chipotle in adobo is different. 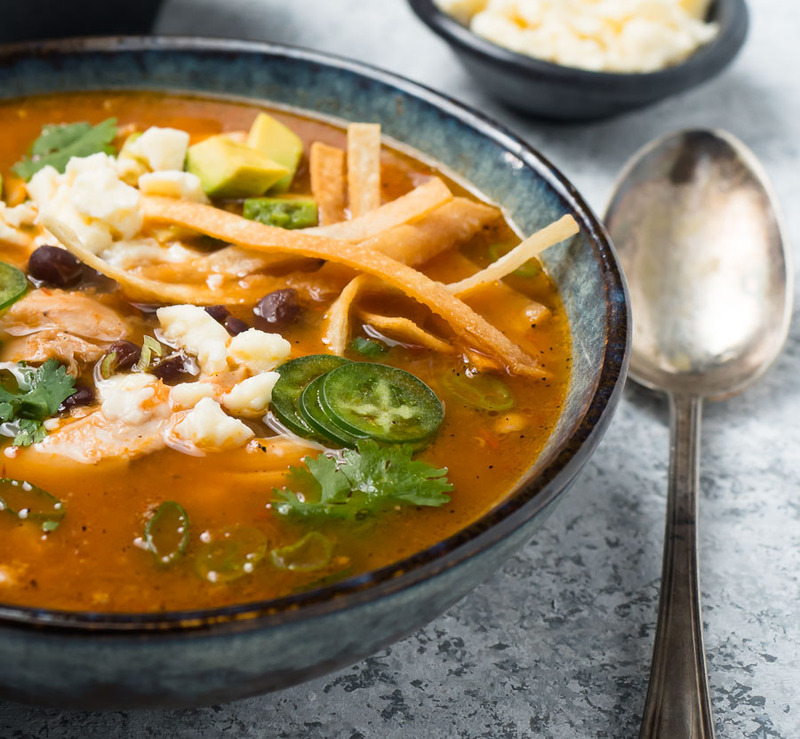 Traditional sopa de tortilla uses guajillo chilies. Dried chilies reconstituted in hot water. You wind up with these little bits of chili in your soup. The skin is a little tough though. So I use chipotle chilies in my chicken tortilla soup. No little bits of skin and a little more smoky flavour. Either way is good. I just like chipotles better. Your call, of course. This is where you make your chicken tortilla soup your own. There’s all sorts of garnishes you can go with. Fried tortilla strips. That’s kind of a given. It is tortilla soup after all. Not sure what you’d call it without them. Chicken soup I guess. But the rest is up to you. Avocado. Sliced jalapenos. Cilantro. Sour cream. Cheese. A squeeze of lime for zing. It’s your soup. Go with what you like. 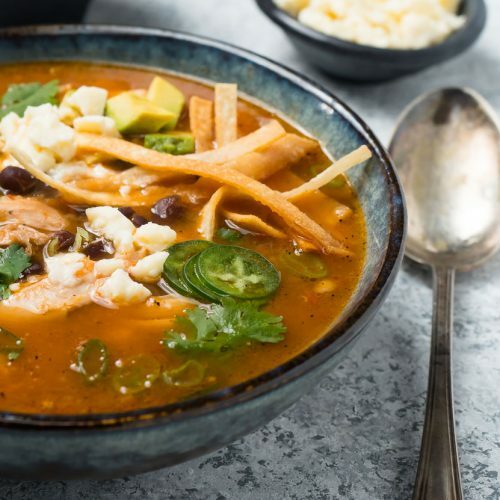 I like cotija cheese in this soup. The soft, fresh stuff. Not the dry anejo coin. It’s super salty on it’s own but it really works here. It doesn’t melt too much so you don’t lose it in the soup. Little flavour bombs. If you can find it, use it. Seriously. This is a meal in a bowl. If you are serving something after it go with small portions. And don’t tell your guests you have leftovers. They will sneak into the kitchen for more. I have never had sopa de tortilla this good in a Mexican restaurant. Wish I had. I would order it all the time. But it’s not so bad. I can make it at home. And so can you. 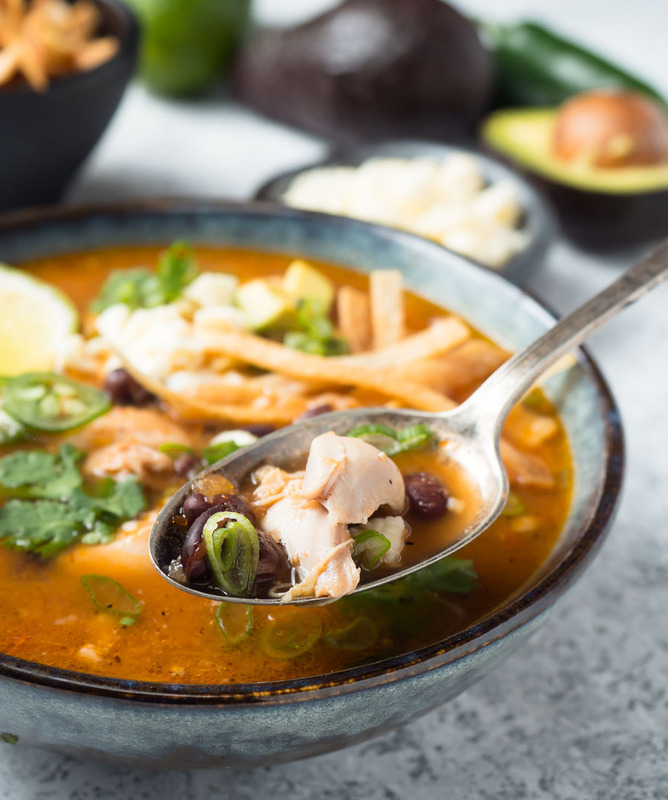 This is chicken tortilla soup that eats like a meal. Big bold tastes that are sure to please. Bring the stock to a simmer. Add the chicken. Simmer gently until the chicken reaches an internal temperature of 175F. This takes 15-20 minutes. Remove the chicken from the stock. Allow to cool. Remove the chicken from the bones. Shred. Set aside. The chicken is perfectly done at this point. If you have time return the bones to the stock and continue to cook. Otherwise keep them for making stock. If desired strain the stock. There will be little bits floating in it. It's not a big deal. Heat a comal or cast iron frying pan over medium heat. Slice the onions into 1 inch thick slices. Peel the garlic. Put the onions and garlic in the dry pan. Keep flipping the garlic. After a few minutes check the onion. If the bottom is browned flip. Keep flipping the garlic. When it has little charred blisters remove it. The onion is done when it gets soft. Slice the tortillas in strips. You need 3 for the soup plus another 4-5 for garnish. Heat enough oil to shallow fry in a skillet. Add about one tortillas worth of strips and fry, moving them around with tongs, until golden. Remove into a bowl lined with paper towel. Sprinkle with a bit of salt. You are making tortilla chips here. Repeat until all the tortilla strips are cooked. Set aside. When you have fried 3 tortillas worth set them aside separately. They go into the soup. The rest are garnish. Combine the tomatoes, 3 fried tortillas, onion, garlic, cumin and chipotle in a blender or food processor. Puree. Heat 2 tablespoons of oil in the pot the soup will wind up in. Add the tomato puree. Fry, covered, for about 10 minutes. Covered is important. The puree will bump. Messy. And hot. Add the stock. Stir to combine. Taste for salt. You will need more. Probably a fair bit more. Creep up on it. Add the black beans and simmer around 10 minutes. Add the chicken to warm through. Put a few tortilla strips in the bottom of the bowl. Add the soup. Make sure to distribute the black beans and chicken evenly. Garnish as you like and enjoy. In appetizer, mexican, poultry, soup. Bookmark the permalink.